VUDU is currently running a special for new accounts. 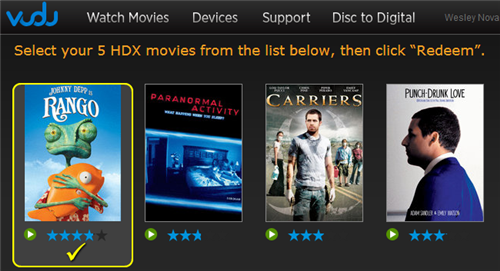 Upon signup (which requires a valid credit card, but you won’t be charged anything unless you purchase or rent a film), you’ll be offered an HDX starter pack promotion that allows you to choose 5 “HDX” movies to add to your account for free, from a limited list of titles. I signed up today and was offered the chance to choose 5 titles from the below list of movies. This list is subject to change and could differ for others. Rango, Paranormal Activity, Carriers, Punch-Drunk Love, Adaptation, Safe, Ghost, Conan the barbarian, Independence Day, The Cold Light of Day, St. Elmo’s Fire, Man on a Ledge, Hope Floats, Psycho, Master and Commander, Crouching Tiger Hidden Dragon, Radio, Last Action Hero, Man on Fire, So I Married an Axe Murderer, Rudy, Loser, Darkman II, The Producers, Death Race 2, Blair Witch 2, Rest Stop, Rest Stop Uncut and Mortal Kombat Legacy. VUDU supports most streaming media platforms, including the PS3, XBox 360, Roku, some Blu-ray players and HDTV’s, Android, iOS and more. If you don’t have an account yet, now’s a great time to sign up and score some free flicks.